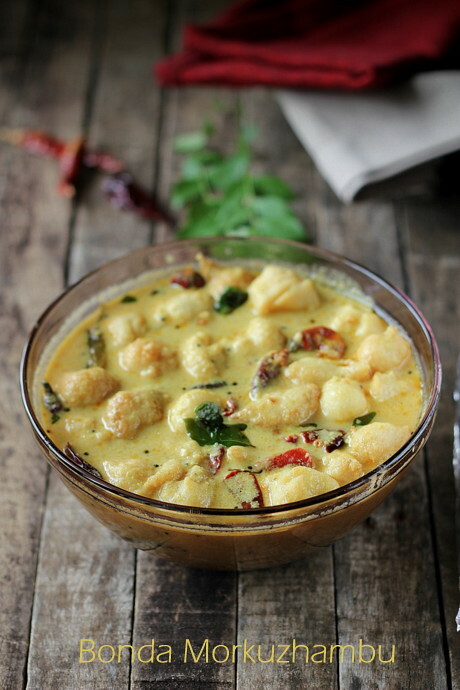 Spicy Chilly: Bonda Morkuzhambu / Spiced Yogurt Curry with Soft melt-in-the-mouth Dumplings! 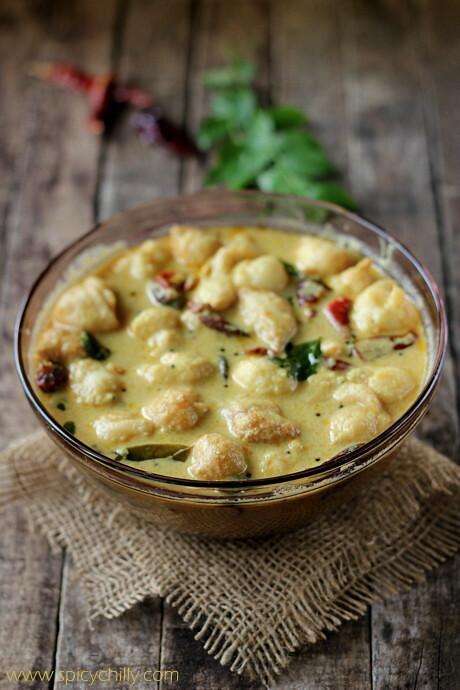 Bonda Morkuzhambu / Spiced Yogurt Curry with Soft melt-in-the-mouth Dumplings! This is a dish I take much pride in! 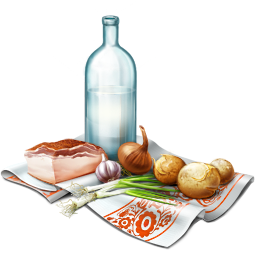 The traditional Morkuzhambu recipe is same in every house hold, length and breadth of T.N, especially in the kitchens of our community. 'Bonda Morkuzhambu' is a preferred delicacy dish which is served between sambhar and rasam in a full leaf meal course for weddings and traditional ceremonies. This is a curry I can always claim to be an expert on. 'Morkuzhambu' and 'Paruppu Thuvaiyal' mostly falls under my Sunday brunch menu since it is the alltime family favourite! I have posted our family version of 'Morkuzhambu' a long time back, during my earlier blogging days and the recipe elaborated here is about how to make the 'melt-in-the-mouth bondas' or the soft dumplings that are soaked in the 'kuzhambu'. As you can see, these 'bondas', which is popular in my circle, are 'vadai balls' made with whole urad dal and not a combination of lentils. 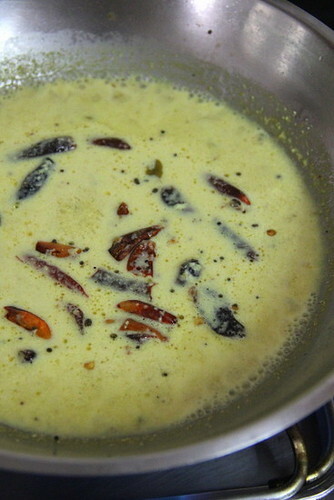 How to make the Morkuzhambu or the Spiced Yogurt Curry? The recipe is here, as mentioned earlier. How to make 'Bondas' (vada balls / dumplings) ? 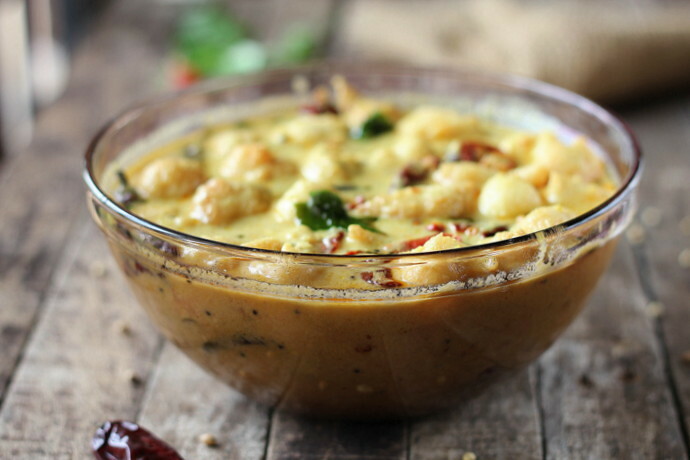 While you prepare the curry you may wash and soak half a cup of whole urad dal (which you use to make idly batter) for half hour to 45 minutes. Drain the water completely add salt and pulse. 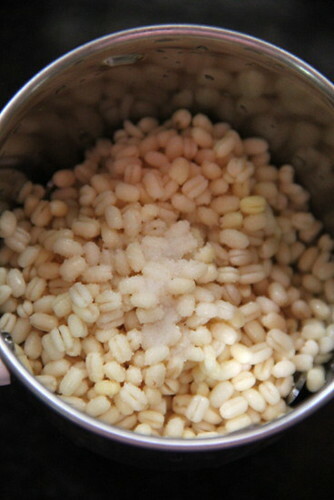 Drizzle water starting from 1/4 tsp at a time and grind the dal to a smooth, light paste. You may add up to 2.5 tsps of water but be very careful as a runny batter will be totally unsuitable to be fried! 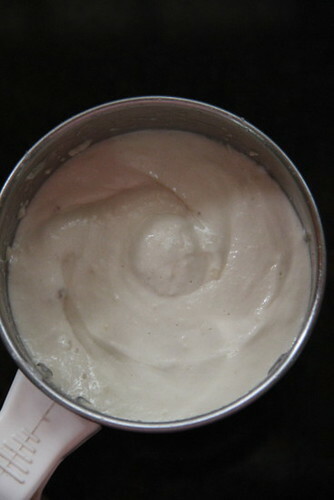 Here's the exact consistency of the ground batter; light and creamy. Slide into hot oil one by one with wet fingers shaping the batter gently into balls (as round as possible which I myself amn't perfect :)) using your right hand fingers. Make them into marble sized balls. It needs a bit practice; shaping into balls and gently sliding in. If you are a beginner, do not pinch in more than 5-6 balls at a time. It's quite fine if they are a little shapeless as in mine too. Turn the balls gently to get fried in a uniform way. 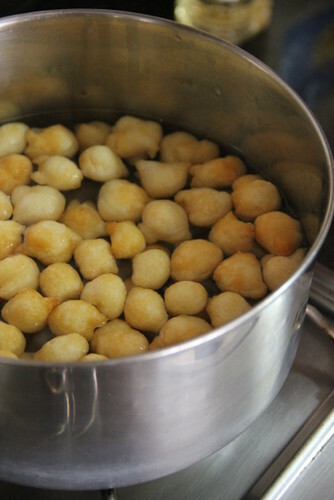 Drain the golden brown balls and drop them in a bowl of warm water. This is to hydrate the balls before dunking in the curry. This way, the soaked balls absorb the curry just as needed! Heat the 'Morkuzhumbu' which you have prepared earlier. Never simmer or boil 'Morkuzhambu'. This can curdle the curry. Drain the balls from the water, after you are done with the final batch.. Do not squeeze them. Just drain the water well. Gently dunk them in the curry. Close with a lid and let it rest for at least 30 minutes before you serve. You may warm up the curry later, but never heat it up again! -->I generally make the basic 'Morkuzhambu' well ahead. It keeps well in the fridge for around 7 days so I take the advantage. I make the 'bondas' and dunk them on the day I intend to serve the 'kuzhambu'. 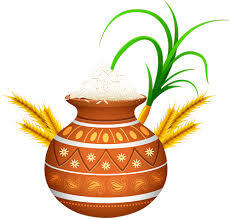 Consume 'Bonda Morkuzhambu' on the same day prepared. -->Take care when you add salt while grinding the batter. It can turn salty with just an extra speck! And it's fine if they are less salty too since they get balanced, taste wise, in the soaked curry! 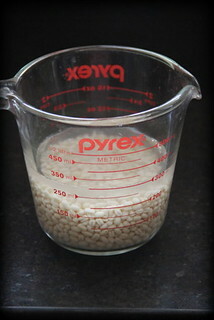 -->If you use less than half cup of urad dal, it becomes impractical to grind well in case you use your mixie. My smallest jar makes a fuss to grind anything lesser than that. So have an eye on the amount. On another note, I get no less than 75 vadais for 1/2 cup urad dal! Hence, better the quality of dal, more the number of 'vadais'. 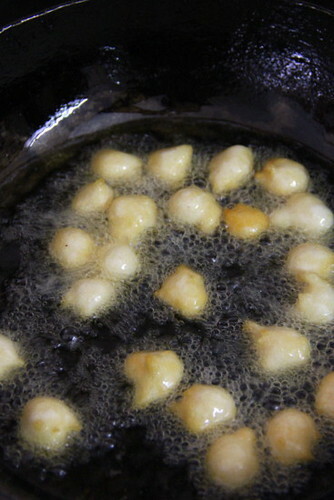 -->The balls get slightly larger in size after the frying part and again after dunked in the curry. So stick to marble sized ones while pinching in to fry. 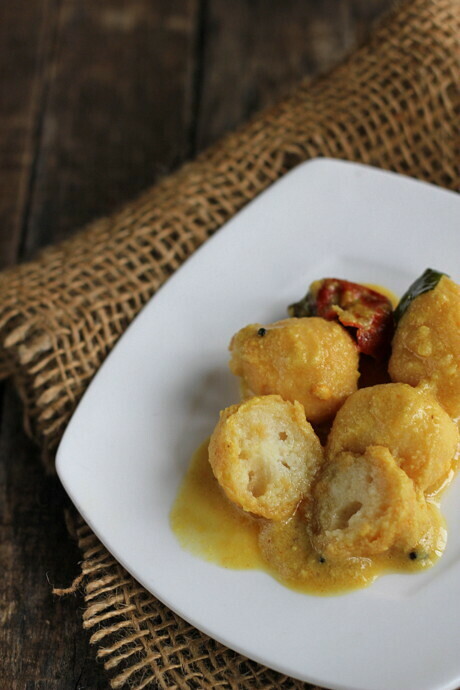 -->To remind you again, always use the best quality of urad dal.They make crispy light vadas that turn spongy and get soaked in the curry perfecting the delicacy~ melt in the mouth! Hey, this is my favoritest version too! I could eat this all day and the next too :) We make the dumplings with besan though. Beautiful pics! We have a similar version in our cuisine but not the same.. Love them anytime.. A protein packed dish which is tasty & healthy :) Lovely clicks, looks very tempting ! 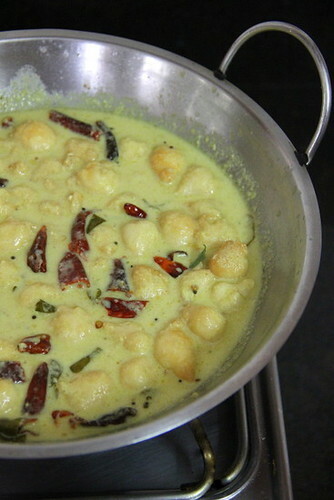 I am drooling here looking at the mor kuzhambu bondas.It looks very tempting to grab. Simply irresistible bondas. Pics look great as well. looks yumm..i can have that whole bowl by myself.. I have not tried this so, a new dish to make. I make morkuzhambu with different veggies but I like this twist on a familiar curry. 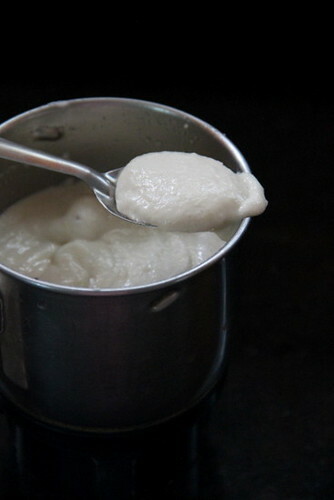 I am wondering if you have a recipe for Kerala style 'Kachiamoru' which they serve in jars, mainly in South side restaurants. It would be wonderful if you could post it. 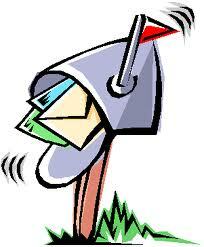 Well, I am playing catch-up and just awhile ago I saw ISG's post about kitchen utensils: mixie and grinder. So I am already thinking urad dal in the back of my mind, and now I come here to find these irresistible vadas!